Would you like to make friends with foreign students? It is the same for foreign students who find it difficult to get the chance to make friends without joining a class or a club together. 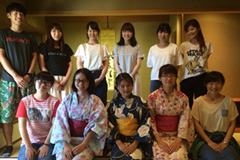 At Prefectural University of Hiroshima, Buddy Japanese students and senior international students organize and operate various international exchange events such as consultation meetings on daily life, volunteer projects, opening a shop at our university festival, etc. Why not become a Buddy student to make friends with international students? 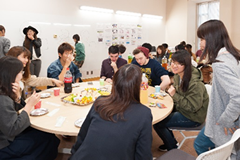 Buddy students organize exchange parties and enjoy the culture of Hiroshima and Japan together with International students. 2016 Experiences of Japanese summer (Nagashi somen (flowing noodles), experience of tea ceremony, dressing in yukata), opening a shop at the university festival, welcome party, farewell party, lunch meetings, etc. 2015 Stroll in Miyajima (Experience of hand-baking of momiji-manju, group stroll, etc. ), Experience of Japanese New Year (Japanese cards or spinning top competition, experience of Japanese nabe dishes, etc. ), welcome party, farewell party, etc. By supporting international student's life before your own study abroad, you will gain some valuable insight! Experience cross-cultural exchanges! Learn how others think and broaden your perspectives! There will be many questions about Japanese culture during your study abroad. You can deepen your knowledge about Japanese culture! Make friends with international students! You will have many opportunities to use a foreign language! If you want to have a variety of experiences through buddy activities, please visit the International Center. Application to be “Buddy student” is available. The leaflet of “Buddy system” is here!